How often do you walk round an exhibition laughing out loud, asks Liz Farrelly? Not because you can’t believe what you’re seeing, but genuinely because framed on the wall are a bunch of very funny jokes, pointing out the absurdities of ‘modern’ life, and played out by a cast of the simplest, hand-drawn ‘characters’. I won’t spoil the jokes; but let it be known that Modern Toss have served up a steaming pile of new stuff — much of it printed on cloth. 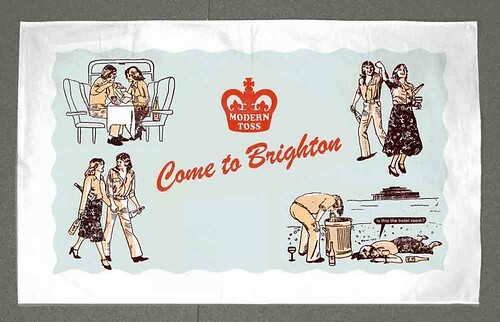 The prompt for all this silliness is the phenomenon of the Commemorative Tea Towel, subverted naturally, alongside other irreverent antidotes to Royal Wedding mania, AKA, a range of ‘Royal Shitnaks’ souvenirs (think mugs, stamps etc). 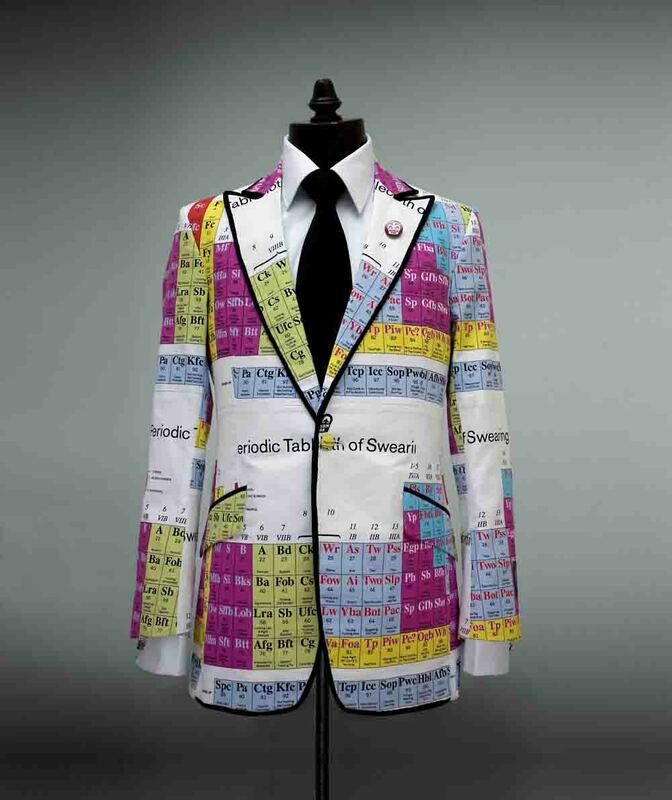 The centrepiece though, made in collaboration with Brighton tailor Gresham Blake, is the ‘Swearing Jacket’ (top), a resplendent rendition of Modern Toss’s Periodic Table of Swearing (below, see also ‘Graphic language’ in Eye 78). This isn’t for the faint hearted, and although the jokes might seem a bit obvious (their charm), the devil is in the detail. Jon Link and Mick Bunnage, the duo behind this art, animation, publishing and TV phenomenon, realise each manifestation of their cranky wit with such verisimilitude that you really do have to look twice. 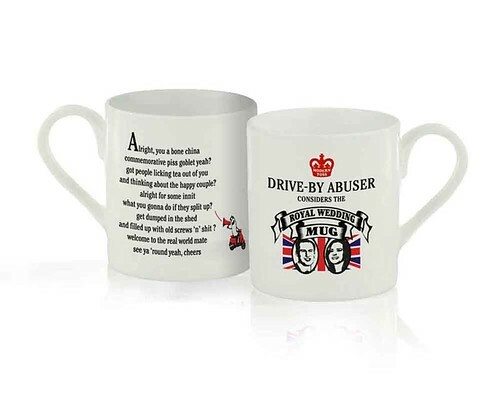 The ‘Drive-By Abuser Commemorative Stamps’ might make it through the post; a series of letterpress samples borrow the visual language of British Modernist poetry; while various off-the-pegs ‘Protest Banners’ are even wheat-pasted onto placards. With a logo that includes a crown, the monarchy was always in Modern Toss’s sights. 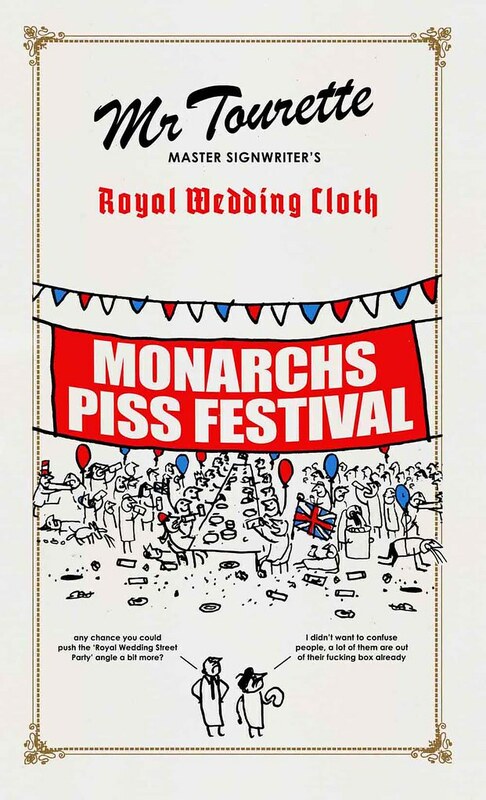 It’s refreshing, though, that their aim is to ridicule the public’s hysterical reaction to the Royal Wedding rather than the individuals involved; it’s Middle England and ‘middle management’ that are most closely scrutinised by Modern Toss. With all this talk of ‘national characteristics’ over the past few weeks, this exhibition reveals one Great British Trait: our willingness to laugh at ourselves – at least before someone else does. Get a free portrait of yourself drawn by the Modern Toss duo, if you dare. 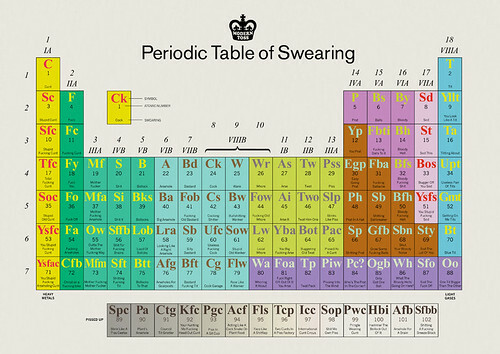 Modern Toss’s spread for ‘They work with words’ in Eye 75, typography special issue. Tony Pritchard’s ‘Graphic Language’ in Eye 78.